When I think of hair mousse, I think of something that has a thick consistency and feels really sticky. But that is not the case. This quickly disappears into the skin and it does not leave any sticky feeling. Palmers Olive Oil hair mousse contains Vitamin E which is great for source for healthy hair. Another important component of this product is Keratin protein. This ensures your hair is healthy and strong. One of the best things about this, is there are no sulfates nor parabens. Sulfates are known stripping the hair of its natural oils. Another good thing is this is alcohol free. Most of us unfortunately deal with frizzy hair. 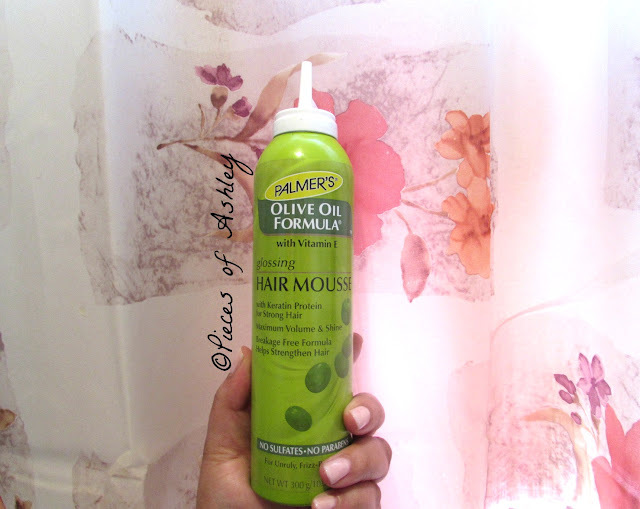 Luckily with this hair mousse our frizz prone hair is eliminated. During the winter months or all year long hair tends to break. This will prevent breakage and help to strengthen the hair. Usually with hair products that are foam or thick leave dry flakes in the hair. No one wants their hair to look like they've just come out of a snow storm. This is non drying flake free and you get maximum volume and shine as well as hair that is filled with moisture! I hope you have enjoyed reading. Are there any hair mousses you like that I should try? ooo this sounds great i hate how frizzy my hair gets after i've blew dry my hair but i never want anything thats too quick! i'll have to check this out! I need to find this super quick, I've tried dozens of mousses that have been nothing but disappointing. Btw, I LOVE your template! Try Walmart. Thank you I worked really hard on the template!